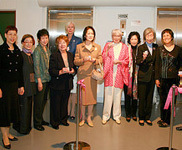 The Hong Kong Branch of the Sogetsu Teachers’ Association was founded on November 27, 1969. The Headquarters of Sogetsu School are in Tokyo, Japan. Our association has steadily grown over the years and at present has 70 full members (holding a teacher’s certificate) and 8 associate members (studying Sogetsu ikebana). Workshops are held throughout the year on a monthly basis. An annual exhibition, comprising group works and individual exhibits, is staged at the Hong Kong Arts Centre every year in late November. At the Hong Kong Flower Show our association is featured with a group work and we invite a highly qualified teacher of the Sogetsu School in Tokyo to give a demonstration at the flower show to be enjoyed by the Hong Kong public. During the duration of the Arts Festival patrons of this event can admire a Sogetsu ikebana creation in the City Hall Foyer, which is put up with the compliments of STA Hong Kong Branch. The Hong Kong Branch of the Sogetsu Teachers’ Association welcomes new members from all over the world.